I believe the original inspiration for Urban Spaces came from New York’s Carlton Arms, a boutique art hotel. 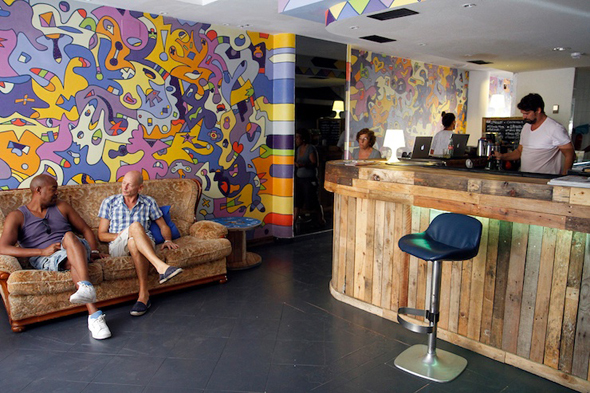 Why did you choose did you choose urban art and graffiti as the primary theme for your own hotel? Yes I got the idea from a photo book by Bob Coulter called Bad Girls Hotel, that was entirely shot at the Carlton Arms Hotel through a fish eye lens. There are a few reasons for me choosing Urban art as our primary focus. Firstly: I love it! It’s exciting, it can be insightful and almost always interesting. Secondly, it’s the biggest art movement in the world. Wherever you go there is always something daubed on a wall, and a lot of the time it is very relevant to what is going on in the locale whether it be socially or politically. This also means that wherever we decide upon opening in the future we can involve local artists and hopefully become part of the community. We have done our best to support island based artists and give them a chance to display their talents at the hotel, and some of our most liked work is from these individuals. Did the hotel present itself to you as an opportunity or had you been deliberately searching for a space to set up your idea? It was always a little dream of mine, and I rented a couple of apartments the year before we opened to rent out to DJ’s and other industry types. It was a success and I didn’t even work at it very hard, so when the opportunity came to take the hotel I knew exactly what my vision for the project was and I didn’t even think about it. I grabbed it with both hands, robbed Peter to pay Paul, and generally pulled every trick in the book to make it happen. We’re still in a bit of debt, but that’s to be expected with a new business. You were a sailer in the merchant navy in your past life, a profession rarely synonymous with the service industry, how did you cope with suddenly having charge of a hotel? Yes I was an Engineer, and the learning curve was/is steep. At the end of the day it’s not rocket science though! In the opening year I had excellent help from Pedro Cervero and Charles Vexenat. They helped me find staff and also helped refine the concept. Once you have systems of work in place then it’s about the staff and delegation. We are still finding our way as it’s only the second year but the staff we have now are fantastic and I really am proud of them. What lessons did you learn in your first year? There’s too many to talk about. The hardest thing I learned was how to tell people I couldn’t pay them…This was very hard. We had so many debts and still have a lot that we are working to pay off successfully, but by in large people have been really helpful and understanding about our struggle. The start up budget that we had for the project was massively underestimated, and next time I’d be in a much better position to make these calculations. There seemed to be a lot of press and publicity around the hotel last year, lesser so this year, was that a conscious decision and can you please fill us in on what has been happening at the hotel this year? Well a bit of both really. We feel that enough people in the right areas know of our existence now, for us to grow organically, but we needed a big push to get our name out to these parties. Though we are an art project and as such must constantly evolve with redone rooms and new paint being added all the time, we also recognised that as a business we needed to improve. So we’ve concentrated less on the surface of the hotel and more on the core. We have more organisation, provide a better service, and have improved in every area whilst still managing to move the project along with 5 newly decorated rooms, and a roof terrace which is nearly ready for opening with a vending machine for use 24 hours containing some very interesting items. What kind of guests stay at Urban Spaces? It varies greatly. However some people just book us through Booking.com and while some of them get what we’e about, some definitely do not! We have a lot of arty types who search us out, and also DJ’s and Journalists. We don’t have many long stay guests and the average stay is 3-4 days, and many regular travellers like us because of the little touches that we have included for such people like the international and USB plug socckets and the 24 hour room service we provide. I’ve heard that you were also inspired by the Manumission Motel, a particularly hedonistic and debauched destination even by Ibiza standards, is this an atmosphere you wish to re-create at Urban Spaces? Yes! I originally had ideas for a private basement room for members, much like the Manumission Motel back in the day but smaller of course! Music in Ibiza is of great importance to me and everyone around me, but it’s been a little slow in the making with other more important things taking precedence. The roof concept is a private affair with people who have chosen by me, being allowed 24 hour access, and hopefully will be sanctuary for these people sometimes in those hours between clubs closing and afterparties starting (afterparties starting at 4pm? Are they really after-parties?) There is always good music on in the reception, and it is the 1st on the list of standing orders we have written up: Make sure there is music playing! You also encourage the social aspect of the hotel, guests are free bring friends to the hotel and use the space as a meeting place, what area’s of the hotel cater to this social side of the experience? Well we have StrEAT on the ground floor with a wonderful rear courtyard with art and mosaics by SNIK and Lauren Baker, which is a lovely place to chill on a night. The cocktails are great and we have a small but well formed menu, which has been improved upon slightly from last year’s with a few new dishes, and improvements made to many of the rest. The cocktails are great and the beer is cheap! The roof as I’ve already mentioned will allow people to have somewhere to chill 24 hours and entertain people, and each room also has an area specifically made for entertaining friends and chilling, with a large minibar, we like to call a Maxi bar and a large selection of food and drinks available 24 hours on room service. Is the hotel a 24 hour experience then? Yes it is! Our night staff will receive guests, cook and make drinks for then all through the night. Each of the rooms is a unique work of art by a different artist, can you tell us who was involved with each room? The concept behind the hotel was to fill every space with art and also every room. Also, in order to keep the hotel relevant and fresh we want to keep the rooms and art changing. The longest we will have a room decorated 1 way is 2 years. Some of the other art will be around longer I’m sure but only 2 years for the rooms. The list of artists who are involved in the project so far is quite large, and I am amazed by how the work has varied. We wanted to change more of the rooms this year, but ran out of time in some cases, and also had requests for certain rooms, which we always try our best to cater for. The most important artist in the beginning for us was Inkie. He loved what we were about and what we were trying to do and really helped us out. His room will always be his room, and he’s part of the family. Other artists involved are (not in any order) Schoony, SNIK, Jerom, Hosh, Tito from Arteria, Chapter, Solo, Diamond, Yas Mina, Mikey Brain, Raul Moya, Philth, n4t4, Marcus Barnes, Rebecca Girault, Lauren Baker, Czar, Nicholas Dixon, Mr. Donka, Julisz, and Posh Fruit. How did you choose the artists involved? Well to start off I was really lucky to receive some help from Paul “Dizzi” Saunders who runs Urban in Ibiza and also the West Bank Gallery in London. He has lots of expertise in this area and is a great guy. He put me in touch with Inkie and a few other artists, and then Mikey Brain heard about the project and helped me from another angle with more artists. Next on the list was Tito from Arteria. I was buying supplies for the first rooms and got talking to Tito, about the project and he put me in touch with some local artists and their work was amazing at the hotel. He also completed a room! Have you added new artists to the mix this year, if so, who? Yes well this year we changed some of the rooms and some of the artists either rehashed or touched up their rooms. New in we have Schoony, wo’s Boy Soldiers are famous on the silver screen as well as becoming very collectable items in their own right. We have one emerging from a wall holding a rose red grenade! Inkie touched up his room, and Solo added a lot of work to his room. Mikey Brain totally changed his room whilst new boy Diamond filled his monochrome room with his take on many iconic slogans, and Posh Fruit gave us a beautifully dreamy and calming fairy tale room complete with Unicorn and dream catcher. Finally SNIK gave us a fantastic multi layered stencilled room which is stunning and Marcus Barnes did a beautiful piece on the stairway to the roof. Yes Non-guests can use StrEAT and the roof terrace when it is fully functional. StrEAT is open 24 hours for residents. We expect to do a few live art events connected to pop up restaurants on occasion on the roof as well as using it for a chill out area. The rear courtyard is open all day though we try not to make noise outside too late for fear it will piss the neighbours off!